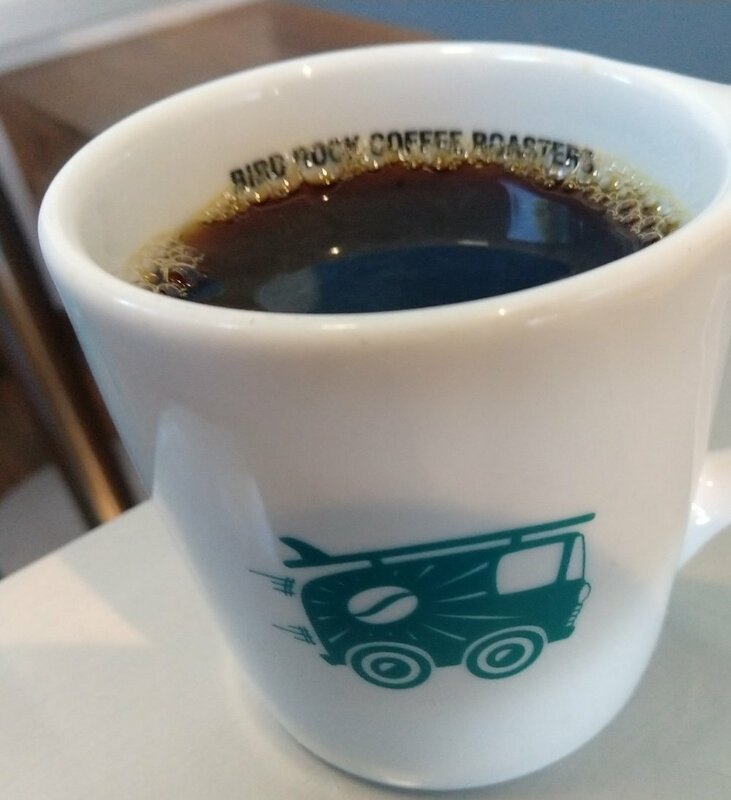 My wonderful fiancée and I stopped by a local Little Italy coffee shop the other day called Bird Rock Coffee Roasters in Little Italy, San Diego. It's nestled in at the corner of mixed-use building right across the street from the delicious chicken place Crack Shack. This was my first time stopping in to get a taste of their coffee goodness, however, and I was glad I did. The shop is well-lit and has a series of eclectic art along its walls. The baristas were very friendly and non-pretentious, which is a huge plus. Their menu is straightforward and classily minimal. They don't have a menu filled with hard-to-read titles and calorie counts (I'm looking at you Starbucks! ), just a clear list of their offerings. I settled for a 12oz coffee Francisco's Reserve, from El Salvador, and my fiancée got the Honey Cinnamon latte. This may sound a tad strange, but I really liked their in-house mugs. Solid, white ceramic, with a cool graphic of an old VW Westfalia that has the delicious coffee bean on its side, with a surf board on top. I loved the uniqueness of it and certainly made the coffee much more enjoyable to drink. I’m pretty sure there’s some sort of science behind why beverages taste better when they’re in a aesthetically pleasing vessel, but whatever the case, I liked these cups! Francisco's Reserve earns a 4 cups of coffee out of 5.
delicious! 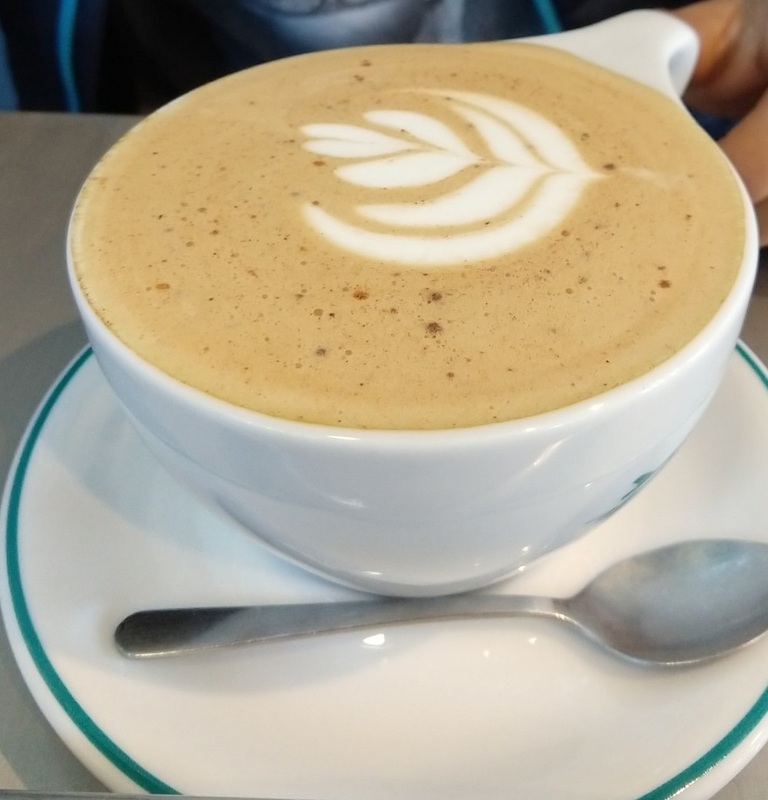 It was perfectly crafted and would be the perfect drink to cozy up with on a cold day. delightful taste of coffee from all over the world.